Hatchet 4 Night #Victor Crowley Lives Greetings, fellow horror fans, Big Mike here sharing a really cool experience I got to be a part of at the Arclight Hollywood on August 22nd, 2017. This year is the 10th anniversary of the release of Adam Green’s Hatchet. Son Of Monsterpalooza! Big Mike Meets The Stars of Friday The 13th! Big Trouble In Little China! Texas Chainsaw Massacre! And More! 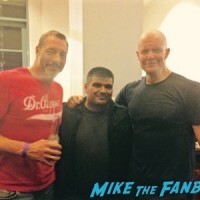 Special Guest October 1, 2015 Big Mike, Conventions, Fanboying!